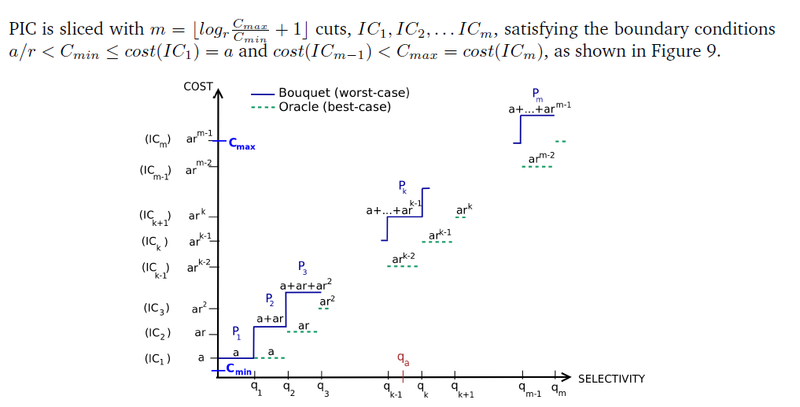 At first glance, the plan bouquet approach, as described above, may appear to be utterly absurd and self-defeating because: (a) At compile time, considerable preprocessing may be required to identify the POSP plan set and the associated PIC; and (b) At run-time, the overheads may be hugely expensive since there are multiple plan executions for a single query – in the worst scenario, as many plans as are present in the bouquet! 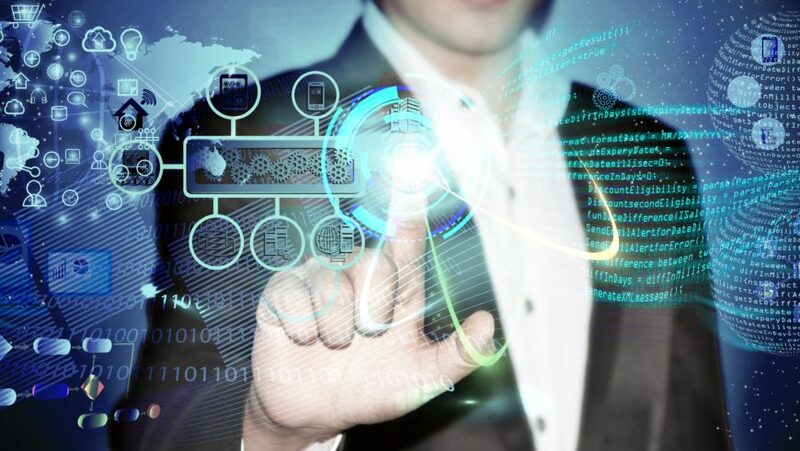 However, we will now make the case that it is indeed possible, through careful design, to have plan bouquets efficiently provide robustness profiles that are markedly superior to the native optimizer’s profile. Specifically, the bouquet mechanism delivers substantial improvements with regard to MSO, the robustness metric defined in Section 2. For instance, the runtime performance of the bouquet technique on the example query is profiled in Figure 8 (dark blue curve). We observe that its performance is much closer to the PIC (dark green) as compared to the worst case profile for the native optimizer (dark red), which is comprised of the supremum of the individual plan profiles. 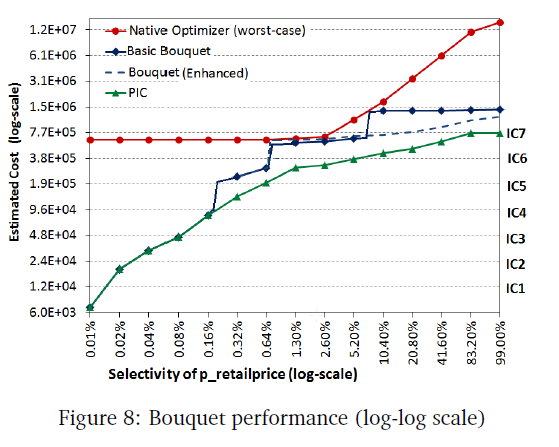 In fact, the MSO for the bouquet is only 3.6 (at 6.5%), whereas the native optimizer suffers a sub-optimality of around 100 when P5, which is optimal for large selectivities is mistakenly chosen to execute a query with a small selectivity of only 0.01%. Our motivation for the cost-based discretization of the PIC is that it leads to guaranteed bounds on the MSO value. For instance, we now prove that the cost-doubling strategy used in the 1D example results in an MSO upper-bound of 4 – this bound is inclusive of all exploratory overheads incurred by the partial executions, and is irrespective of the query’s actual selectivity. In fact, we can go further to show that 4 is the best guarantee achievable by any deterministic algorithm. For 1 ≤ k ≤ m, denote the selectivity location where the kth cost step (ICk) intersects the PIC by qk, and the corresponding bouquet plan as Pk. All the qk locations are unique, by definition, due to the monotonicity and continuity features of the PIC. Finally, for mathematical convenience, assign q0 to be 0. Lemma 3.1. If qa resides in the range (qk-1 , qk], 1 ≤ k ≤ m, then plan Pk executes it to completion in the bouquet algorithm. Proof. We prove by contradiction: If qa was located in the region (qk, qk+1], then Pk could not have completed the query due to the PCM restriction. Conversely, if qa was located in (qk-2, qk-1], Pk-1 itself would have successfully executed the query to completion. With similar reasoning, we can prove the same for the remaining regions that are beyond qk+1 or before qk-2.